Dear Kimmy-I have a quilt that turned out really nice and I want to enter it in a show. I was told that I should block the quilt first, but I don’t know what that means. How do you block a quilt? What difference does blocking make? Kimmy says: What a great question! 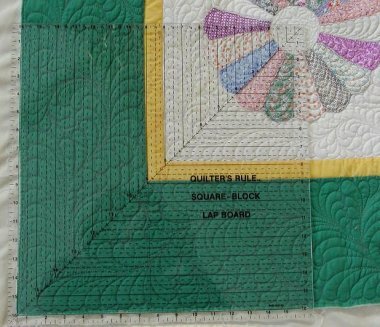 I am glad that you gave me the chance to explain this to you, because properly blocking your quilt will make a huge difference in how it will hang in the show and it will also make a huge difference in how the quilt will score in the judging room. A properly blocked quilt will hang flat, its corners will be square and the entire quilt will have a much crisper, more professional finished appearance. 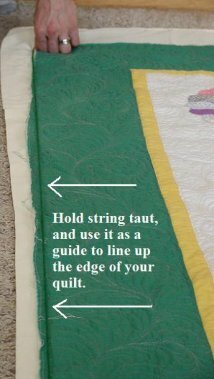 Keep in mind that not only show quilts should be blocked; any quilt that needs to hang straight and flat will benefit tremendously from this process. Before you get started, you must make absolutely sure that the fabric used in the construction of your quilt is colorfast. If you are in any doubt about this, *do not get the quilt wet! * After all, it doesn’t much matter if the quilt is flat if there is red dye bleeding all over the white setting triangles, right? You will need an area that is big enough to accommodate your quilt as it dries, and gives you enough to room to move about during the blocking process. Good choices are an out of the way bit of floor space or a large table, such as a ping-pong table. If you have pets, make sure the quilt will not be in an area where the pet will walk on it or disturb it as it dries. Make sure that your space can be blocked off to keep it free from foot traffic. You will also need several fans (I like big floor fans) and some clean sheets and blankets to protect your floor or table from the wet quilt..
Next, evaluate your quilt. Is the whole thing wonky, ripply, and out of square? In that case, it is probably best to wet the entire quilt in a bathtub. Before adding the water, drape a sheet across the tub and lay your quilt on the sheet. This way, when removing the heavy wet quilt from the tub, you can lift it using the sheet and prevent any stress to the quilt’s seams or the delicate quilting stitches. Using the sheet to maneuver the wet quilt, squeeze out as much excess moisture as possible, carry the quilt to the area which you have prepared for it and lay it out on the clean sheets or blankets. If your quilt is only a little out of whack, with just a bit of fullness that needs to be put in its place, you can skip the bathtub and simply lay the quilt out on the sheets and moisten it using a spray bottle or a small canister sprayer. Regardless of which method you used to wet the quilt, lay the quilt out nice and flat, smoothing out any fullness as you go. Look at the interior of the quilt. Are any blocks puffing up? If so, pat them gently into place to flatten them. Next, make sure that the sashing lines and piecing lines are straight and that the seam lines connecting the borders to the quilt’s interior are straight as well. (Photo B) Nothing ruins the look of a quilt more quickly than lines that are supposed to be straight but are not. These lines are crucial to the look of your finished quilt, so take the time to fuss with them. Now, you'll need a tool that will help you determine if your corners are square. 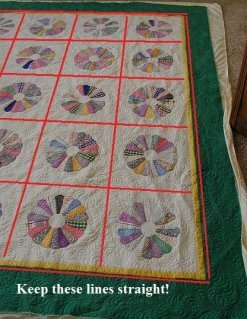 I use a big, square rotary cutting ruler, lining up the edges of the quilt’s corners against the ruler’s long lines to make sure that everything is as straight as possible. (Photo C) Again, if anything is out of line, pull or squish until its all square. The string is straight, so you can easily see if any of the edges of the quilt extend beyond the edge of the string and need to be eased back in, or if they're pulling in from the string and need to be smoothed back out. Make sure that the edges of the quilt are as straight as possible, because if they're crooked, it will be quite noticeable when the quilt hangs. If there are ruffly areas in the borders, use your hands to gently press and smooth until the border lies flat. Set the fans to a medium speed to create a gentle, steady breeze. Go get all of your dining room chairs and build a barricade with them to keep everybody out of the area while the quilt dries. (to add extra dramatic effect to this step, I always make sure that there’s a trash can, a lamp and a globe teetering high atop the chairs so nobody will be tempted to go anywhere near my area for fear of making everything come crashing down). Drying time varies considerably, depending on how wet the quilt is and how much humidity is in the air. In general, if you got the whole quilt wet you should plan on at least 2 days of drying time, possibly more if you live in a very humid climate. It is important to let the quilt dry thoroughly, as moving it while it’s still damp will undo all of your hard work. Yes, it seems putzy, and yes you will lose some floor space during the drying process, but in the end you will have a beautifully flat and square quilt that will wow the judges and maybe even win you a ribbon! "Can I block an already bound quilt?" Yes, you can, but keep in mind that this may become a bit tricky depending on whether or not your quilt shrinks a lot during blocking. If you did not prewash any of the fabrics in your quilt, you may see significant shrinkage if you fully wet the quilt. Your binding fabric may or may not shrink at the same rate. If it does not shrink as much as the rest of the quilt, you may end up having very wavy binding, which will then need to be removed and reapplied. To avoid this problem, I will usually try first to block a bound quilt using a steam iron and a flat surface. Lay the quilt out on a pressable surface (not your dining room table, because you're going to steam the daylights out of this quilt and that'll be the end of your lovely wood veneer! ), square it all up and then, using a hot and steamy iron, hover the iron over the surface of the quilt while letting it deliver big juicy shots of steam to the quilt. As the iron steams merrily away, watch your quilt; you will see the poofy areas start to sag and shrink. It's like magic! After steaming the area well, use your hands to manipulate and squish any poofy areas into place, then come back in with the iron and press the quilt to set it. When you've finished with this section, let it dry and cool well (this is not a process you will want to rush! ), move the quilt to expose a new section, and repeat. Work your way through the quilt and see if you're able to do enough squaring with this method to avoid having to take a chance on wetting the whole thing. PLEASE NOTE: this method is not suitable for quilts with wool or polyester battings. These battings do not react well to all of that hot steam. A poly batt will melt, and a wool batt will felt. You don't want either of those things to happen. This might seem like a lot of putzy work, but I think you'll be amazed at what an impact a good blocking job can have on a quilt. Enjoy the results!